A major photographic and cultural find is just now coming to light. Vivian Maier, a nanny, photographed the streets of Chicago on her days off from the 1950’s into the 1980’s. Her photography, seen by hardly anyone until now, is extremely strong. 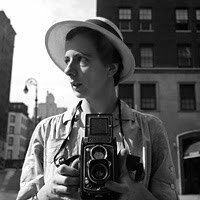 Initial predictions are that Vivian Maier will rank among the most important of 20th century street photographers. I’ve only seen the few images in the video below and at the photo blog created in her name. I was immediately moved by these few images. There are at least 100,000 more of her photographs waiting to be seen. Many of them are on rolls of film that have yet to be developed. The discovery of Vivian Maier’s photography is a gift to our cultural heritage. Yet, it is bittersweet. She died in 2009 due to illness and did not live to see the excitement her photographs have caused in such a short time. It is a shame that she is no longer with us. We don’t know much about Vivian Maier. I’m sure we will regret not having known her. December 26, 2010 in Photography Commentary.